General Secretary Junge with Lutheran Community Care workers in Alice Springs, Australia. LCC staff explained how the organisation serves and meets needs of people who are doing it tough through its emergency relief program. What is your most prevalent impression from visiting the churches in New Zealand and Australia? There are so many things that I remember with fondness: The work among the Aborigines in Central-Australia, with the huge commitment of the church towards accompanying them. This is a demanding ministry, but there is no doubt in the church that this is the ministry into which it is called. The many schools of the church and how they provide an opportunity to interact with society at large. The deep and rich ecumenical relations - I was impressed by the national Catholic-Lutheran dialogue and its results. The role the church plays in theological education and partnership in mission among other LWF member churches in South Asia is another matter to be highlighted. Finally, there is an amazingly strong vocation to serve, both nationally and internationally through specialized structures, the Lutheran Community Centers (LCC) and the Australian Lutheran World Service (ALWS). LCA has 60,000 active members on a whole continent – what opportunities and challenges does this offer the church? I'm convinced that it is not the numbers that make the difference in view of the footprint of any given church, but how it engages people and society with the transforming power of the Gospel of Jesus Christ. This is also true for the Lutheran church in Australia. Scattered over this large territory, always in a minority situation, the church knows of its deep spiritual bonds that link people and congregations together to form a church. If this wouldn't be the case, it would be difficult for them to sustain themselves. As I often say: “A church on its own is a church at risk”. In the vastness of Australia and New Zealand the LCA is well aware of this fact. It was founded after the merger of two different Lutheran churches, that were already established in Australia. Because of that there was from the beginning an understanding that while relationships of communion can be challenging because of the need to negotiate differences, they are at the same time an incredibly rich source of strength and resilience. This insight of the church resounds with the wisdom that has grown among LWF member churches as a result of their journey as a communion. 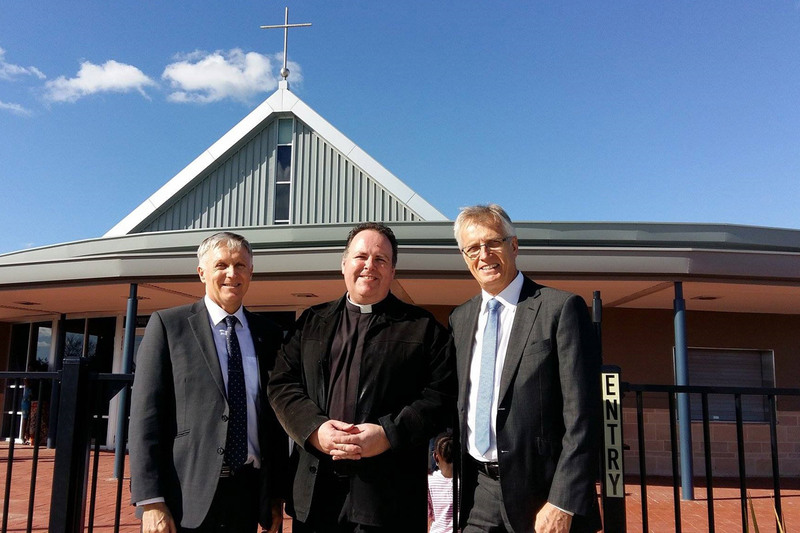 From left to right: John Henderson, Bishop of the Lutheran Church in Australia, Reverend Matt Anker and Martin Junge, LWF General Secretary, at the Lutheran church in the rural town of Shepparton. The Lutheran community was revived in recent years by the resettlement of African refugees, which has seen the congregation swell from around 20 people to between 150-200 worshippers. How did you experience the indigenous population in that context and how is the church serving them? To begin with it is important to say that there are many indigenous groups in New Zealand and Australia. From the Māori in New Zealand to many groups of Aborigines in Australia. One cannot compare them at all. What they all have in common, though, is the pain of history during colonization with loss of land, the terrible violence they were subjected to and their destitution. A lot has been done from the official side to address these injustices of the past, yet the trauma, the alienation and the cultural uprooting seem to sit very deep, particularly in the Australian context. I visited the work of the church among Aborigines in the city of Alice Springs. I was able to speak with pastoral leadership and local leaders. There is a long history of engagement. The plight of the first missionaries arriving there is hard to imagine, and their perseverance quite inspiring. A relationship of trust and affection has grown, which binds the Aborigines and the church together in particularly strong ways. I understood how much the Aborigines value the Lutheran church because it addresses them in their own language. Unfortunately, I was not there on a Sunday, to worship with them, but I was able to hear a choir of aboriginal women, which was just breathtaking. Their singing seems to come from immemorial times, connecting dimensions, knowledges and wisdom of which we are totally unaware. I pray for endurance of the LCA to uphold this valuable ministry. Because it seems to me that this journey, although more than a hundred years old, is only just beginning. What are some of the theological conversations that the church is having? On the one hand the whole question of sustaining and renewing theological education and formation, in view of current challenges in mission. The church is looking into ways of reaching out to bring more people into a conversation of God’s gift of grace in their lives and it is looking into ways of equipping its leaders, lay and ordained, for that purpose. The church continues debating the full inclusion of women in the ordained ministry. During the last synod a vote was taken which showed there is a majority favoring the ordination of women, yet it fell short of the 2/3 of votes required. Solid theological material has been developed and a new theological statement on this question is being prepared in order to equip the church to continue processing this very important question. I was delighted to see the programs and plans for commemorating the 500th Anniversary of the Reformation, with many good and creative ideas being implemented. The concept of ecumenical accountability, which has been so important for the LWF is fully embraced by the LCA and beautiful plans for various ecumenical events will be implemented. You mention the national and international service of the church, how is this manifested with regards to the global refugee crisis? A highlight was my visit to the congregation in Shepperton, which welcomes and integrates with much love and compassion resettled refugees from the Democratic Republic of Congo , Burundi and South Sudan. Many of the refugees were met already much earlier in their lives by Lutherans, for instance in the Kakuma Refugee Camp in Kenya, which is supported by the LWF. For these refugees, the “L” of “Lutheran” stands for compassionate embrace and service. The LCA offers this embrace through the LWF and its service in refugee camps. Through its congregations it is also embracing the same people when they have been resettled in Australia. I rejoice over this sustained commitment to protect refugees, and how it is being expressed by the St Paul's congregation in Shepperton. I sensed that by its inclusiveness, by the way it embraces diversity and upholds the dignity of every single person, this congregation is speaking God's mind in particularly strong ways.